It won’t take five days to absorb the news from special counsel Robert Mueller and Attorney General William Barr, or five months, or even the five-plus years left of President Donald Trump’s tenure if he is reelected in 2020. Indeed, in 50 years historians will still be at work in the research room of the Donald Trump Library trying to assess exactly what the investigation and conclusion that no collusion occurred meant to the Trump presidency, to the agencies involved, to the country and to the world. I know this particularly well, as on Monday it was announced I will be returning in July to lead the Richard Nixon Foundation as president/chief executive and as a member of the board of directors. It’s a job I first held nearly 30 years ago, after previously working for the former president as a writer in his retirement in San Clemente, California, and New York. At 63, I’m at that age when perspective is infused with experience but not crippled by nostalgia. That perspective has made me cautious about issuing sweeping pronouncements about the significance of this or that event. This is especially true of unread reports, even one as exhaustively researched as Mueller’s. The research room at the Nixon Library in Yorba Linda, California, is among the busiest in the superb system of such facilities run by the US National Archives and Records Administration, which jointly operates the newly refurbished library with the Nixon Foundation. Those researchers and historians are the lifeblood of the presidential libraries, as they will be of the future Trump Library. In the future Trump Library research room, scholars will wrestle with the unredacted Mueller report and interpret it among the backdrop of the booming economy Trump oversees, the negotiations with China and realignment in the Middle East, his two Supreme Court appointments (and maybe more) and 36 federal appeals court judges (certainly more on the way). As for now, critics of Trump will seize on whatever they can find that is worst in the report. Defenders will point to no collusion, no further indictments and the announcement that the special counsel wasn’t impeded in any way. Russia attacked our election and — thank God — not one American and certainly not the president helped it do so. But we don’t know what the significance of the special counsel’s report will be, and we won’t for decades and decades, when some future historian does the work of arranging the events of the whole Trump presidency in terms of what mattered most, when and why. 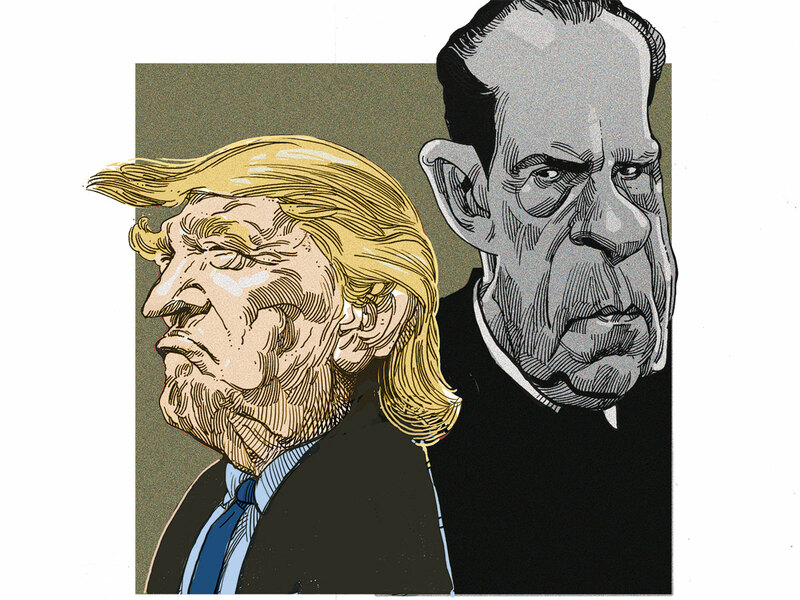 (There are parralles between the investigations of Trump and Nixon presidencies). President Nixon’s defining legacy is to have been “the first mover” on the strategic relationship that is now and will remain for decades the central relationship on the planet: that between the United States and China. Nixon was also the “first mover” on comprehensive environmental protection for the planet with the establishment of the Environmental Protection Agency and his signing of the Clean Air Act and the Endangered Species Act. His intervention in the 1973 Arab–Israeli War was a major intervention in history. But as history compresses events and especially presidencies, most crucial was probably the beginning of the rapprochement with the only other superpower left in the world. As we head into the dangerous decades of our relationship with China, what matters most from Nixon’s career is not the political controversies that swirled throughout his tenure, not his political combat with Democrats and the press, not his resignation (no, not even his Supreme Court appointments). What matters about Nixon in 2019 is obviously what he launched by landing in Beijing in February 1972. Of course, the Mueller report matters. But it will be oversold this week by critics and defenders. The disappointment that bleeds through the left’s “chin up; this is the end of the beginning” rhetoric is an admission against interest that history is not likely to count the Mueller probe among the most important events of the Trump years. That won’t slow down the breathless takes on broadcast platforms large and small this week, but that’s how history works. It slowly but inevitably reduces every presidency to a few high peaks and low valleys. With Nixon the highest peak came in 1972. With Trump we have no idea what the peak will be, but the Mueller report does not appear to be much of a valley. Hugh Hewitt is a prominent American broadcaster, writer and political commentator on NBC, MSNBC, and CNN.